In his short note appended to the album No Limits for Tumbao César Orozco makes a case for the generous helping of Cuban and Venezuelan traditional forms – changüi, nengón and joropo – that he has melded into the music of the album. Well he needn’t have worried anyway. The music speaks for itself. And what a fine album it is. Cuban musicologists sometimes explain ‘tumbao’ as bassline melody, something Cuban musicians are blessed with, or so they would have you believe. But from Mr. Orozco’s album it becomes clear that this is musical ingenuity that informs the best music of South America. And the music of No Limits for Tumbao is certainly one of those classic examples of this. In jazz terms, it is music that swings. 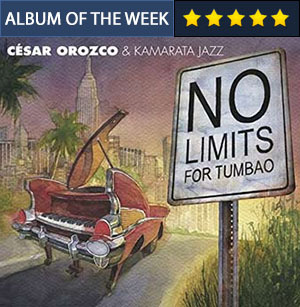 On this album César Orozco looks closer to the drama, the wit, variation and endless elegance of the music of Cuba and Venezuela, alone and also when it collides with the idiom of jazz. César Orozco’s musicianship yields compelling variety and prismatic possibilities in the rumba and the joropo in the songs that employ the forms in question, and the majesty of changüi and nengón in places where you would never thought existed. Such is the ingenuity of César Orozco as he looks over the expanse of the grand piano and of the variety of keyboards that he employs here. Moreover it feels like this is the most natural territory for him. Ornamentation tends to be pliant and the expressive power of the music knows no bounds. Another aspect of the music that certainly recommends the album to listeners is the wonderful repertoire and the manner in which it has been arranged. Now much of the credit may be attributed to César Orozco who is responsible for almost all of the compositions and these arrangements as well. But let us not discount the musicians who have interpreted it, played around with and improvised upon it. And I do not mean just the invitees, Yosvany Terry, Paquito D’Rivera, the ubiquitous Pedrito Martinez, Luisito Quintero, Gary Thomas and others but the regular members of César Orozco’s band, who know and understand the leader’s style, but also know how extrapolate on his ideas. The results can be heard everywhere, but especially on “Jorozco” and “Galeron”. It is clear that César Orozco is a risk-taker who is not afraid to put everything on the line for the music and in the end far more dramatic and expressive. Much of the drama in this music comes after the note is played, with the decay and the play of the overtones giving it a haunting inwardness. By letting the instrument ring (easier on the Rhodes), investing in the silences and slowing the pace down just that tad, César Orozco harks back to the music’s origins in traditional forms, which makes this repertoire yield stronger and absolutely memorable results. Analysis aside, there are really two compelling reasons to own this disc: it is endlessly entertaining and vibrant, and it is meticulously performed and recorded for lovers of all music no matter where or in what idiom it originates. Track List: No Limits for Tumbao; La Rumba Esta Buena; Jorozco; Yobo; Vladitimba; Faith; Galeron; A Nightingale Sang in Berkley Square; Arrival; Para ti Nengón. 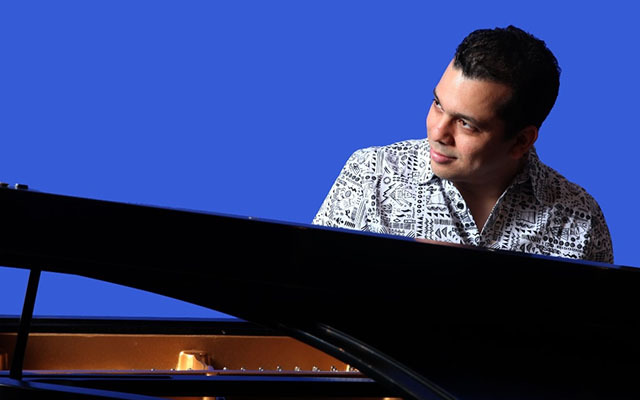 Personnel: César Orozco: acoustic piano, keyboards, Fender Rhodes, backing vocals (2) and kid voice (10); Rodner Padilla: electric bass; Euro Zambrano: drums (1, 3, 4 & 9); Pablo Bencid: drums (7); Vladimir Quintero: congas ( 1 & 5); Francisco Vielma: chekere (5), multi-percussion (6), culo’e puya Afro-Venezuelan drums (9); Pedrito Martinez: main vocals (2), backing vocals, maracas, bongos (2); Luisito Quintero: timbales and drums (5); Paquito D’Rivera: soprano saxophone (3); Yosvany Terry: soprano saxophone ( 1 & 7); Gary Thomas: tenor saxophone (5); Linda Briceño: trumpet (5) and vocals (8); Zamira Briceño: violin (6); Manuel Rangel: Venezuelan maracas (3 & 6); Gary Sosias: güiro (1); Willie Torres: guïro (2); Jose Gregorio Ruiz: backing vocals (2); Danilo Orozco: man voice (10); Familia Valera-Miranda: Cuban tres and vocals (10), excerpts taken from the album Antologia Integral Del Son.